To brew Yerba Mate in the traditional way you’ll need a gourd or other cup, a bombilla (metal straw), a flask, and of course yerba! See our selection of all of these accessories and more. The bombilla is a straw with a filtered end. It is used to sip yerba mate, and the closed, filtered end is inserted into the yerba. The top end is open to enable you to drink. The very original bombillas are traditionally made from bamboo. 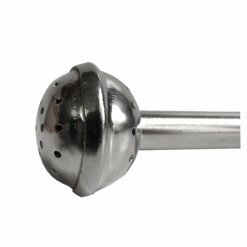 However nowadays it is more common to find bombillas made from metal, and the most popular metal is stainless steel. This is because it doesn’t oxidise and retains its shine with use. Bombillas can also be made from alpaca (German Silver), alloys, silver and wood. Bombillas vary in filter design. The most popular design is the “spoon” filter because the shape enables it to double up to help manipulate the yerba around the gourd. Other designs include a straight filter with slits, a spring filter, the wide brazilian round headed bomba, and other combinations of double and triple filter systems such as a sysem of holes, covered with mesh and then a spring. What is a Mate Cup? The mate cup is anything used as a recipient to drink yerba mate. The most traditional type are made from hollowed out gourds, which are the fruit of the calabash tree. They have been used for centuries as a drinking vessel because once hollowed out and dried they are water tight. Don’t be surprised if the inside of your gourd isn’t smooth and tidy, it is a natural item. The taste of the gourd is bitter, and this itself forms a part of the drink. Other mate cups are made from cane, wood, ceramic, glass and metal. Ceramic and glass mate cups have been growing in popularity because they don’t need any type of special treatment, curing or care. And also some people find the acidic quality of the gourd, together with the bitter yerba a little too much and opt for a gentler version.